Ralph Vaughan Williams was not only a composer of the utmost importance for English music but also one of the great symphonists of the 20th century. He was born on 12 October 1872 in the Cotswold village of Down Ampney, where his father was vicar. Antecedents included the interconnected families of Wedgwood and Darwin. Following his father’s death in 1875 he was brought up at Leith Hill Place in Surrey and educated at Charterhouse School, the Royal College of Music and Trinity College, Cambridge. He was a pupil of Charles Stanford and Hubert Parry, later studying with Max Bruch in Berlin and Maurice Ravel in Paris. At the turn of the century he was among the very first to travel into the countryside to collect folk songs and carols from singers, notating them for future generations to enjoy. As musical editor of The English Hymnal he composed several hymn tunes that remain popular (including Sine Nomine, “For all the Saints” and Down Ampney, “Come down O love Divine”). A long and deep friendship with Gustav Holst was a constructive relationship which was crucial to the development of both composers. Vaughan Williams took three years off his age in order to volunteer for the army during the 1914-1918 war; after a long period of training and waiting he was sent to France in 1916, serving as a stretcher-bearer in the Royal Army Medical Corps. Later, he was given a commission in the Royal Garrison Artillery and found himself in charge of both guns and horses. The carnage and the loss of close friends such as the composer George Butterworth deeply affected him and influenced his music after the war. Youthful atheism eventually settled down into cheerful agnosticism. He was widely read, and heavily influenced by poets and writers including Shakespeare, Bunyan, Blake and Walt Whitman. Vaughan Williams was married twice: in 1897 to Adeline Fisher, and in 1953 to the poet Ursula Wood. A knighthood was offered and refused, but the Order of Merit was conferred upon him in 1935. He died on 26 August 1958; his ashes are interred in Westminster Abbey, near Purcell. In a long and productive life, music flowed from his creative pen in profusion. Hardly a musical genre was untouched or failed to be enriched by his work, which included nine symphonies, concertos for piano, violin, oboe and tuba, five operas, chamber, ballet and film music, a large body of songs and song cycles, and various important unaccompanied and orchestral choral works. His orchestral works include such popular favourites as The Lark Ascending, Fantasia on a Theme by Thomas Tallis, Five Variants of Dives and Lazarus, The Wasps Overture and the English Folk Song Suite. 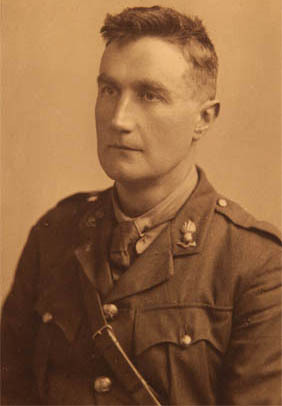 Vaughan Williams as an officer in the Royal Garrison Artillery (1917). Above: A You Tube biography in words and pictures, produced by Society member Colin Lees.